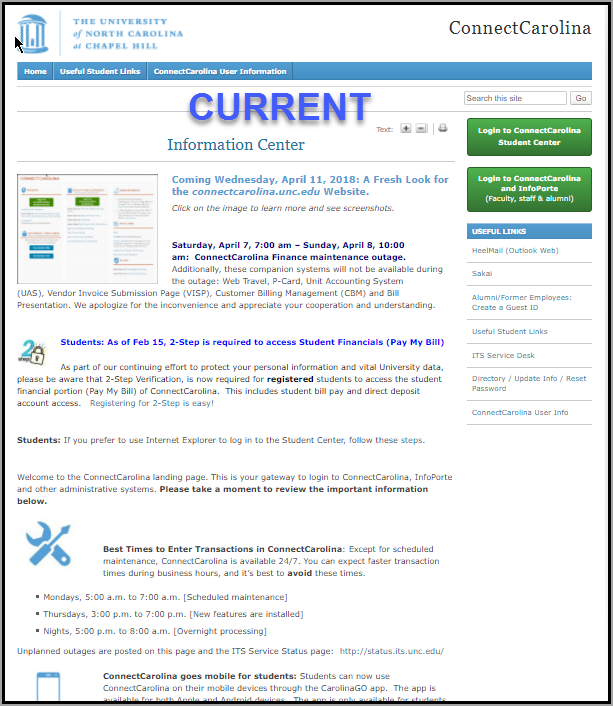 Starting on April 11, you will see a new layout when you type connectcarolina.unc.edu into your browser. 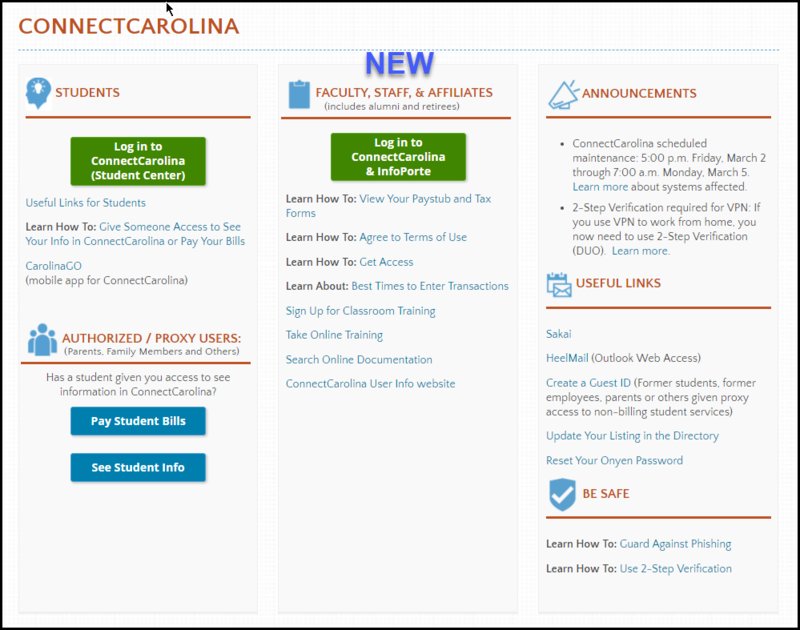 You’ll see the same links you’re used to seeing plus a few extra, and we think the page will be easier to use for those new to ConnectCarolina and for students’ family members who only occasionally log in to ConnectCarolina. There is no downtime or outage associated with this update. We‘ve simplified the page layout and made it is easier to navigate. The links work the same as they do now. Only the look is different. Looking for the InfoPorte link? It’s in ConnectCarolina under Enterprise Reporting on the left . The first column is for students and their proxy users. Like today, students will click the big green button to get to the ConnectCarolina Student Center, and once in ConnectCarolina, everything will work the same as it does now. Click the first link under the green button, Useful Links for Students to go to a friendlier version of the page students currently use (see image below). Important links for Faculty, Staff and Affiliates are in the middle column. 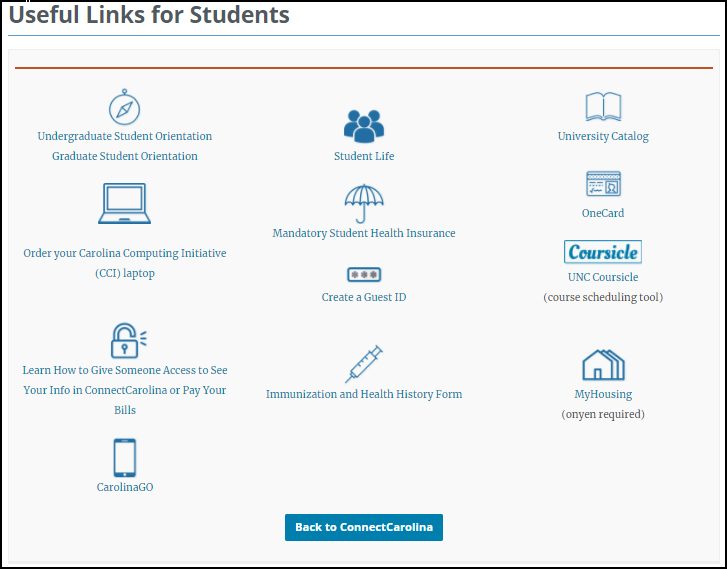 We’ve added a few extra links to online and classroom training, online documentation and the ConnectCarolina User Info website. Looking for the InfoPorte link? It’s in ConnectCarolina under the blue Enterprise Reporting button. The third column includes Useful Links, Security Information and the Announcements section. We hope that you find this page easier to navigate!